Posted by Mae Nowak on Monday, December 31st, 2018 at 2:01pm. On the corner of W Villa Maria and South College Avenue in Bryan, Texas sits the 148 acre Travis B Bryan Municipal Golf Course. The city of Bryan has discussed turning the golf course into a super park for more than 5 years, and over the last year, plans for that are finally being released. According to city officials, "the municipal course had become a financial drain for the city over the years, losing around $200,000 annually on what has been a more than $900,000-a-year operation". The idea of creating a "super park" was primarily focused on the need to use sports and tourism to the economic advantages of the city. The goal is to provide attractions that would bring in out-of-town and overnight visitors. An indoor "sports and events center" with 8 high school-sized courts that can be used for basketball, volleyball and other sports, or as a flexible event venue with 50,000 square feet of floor space. 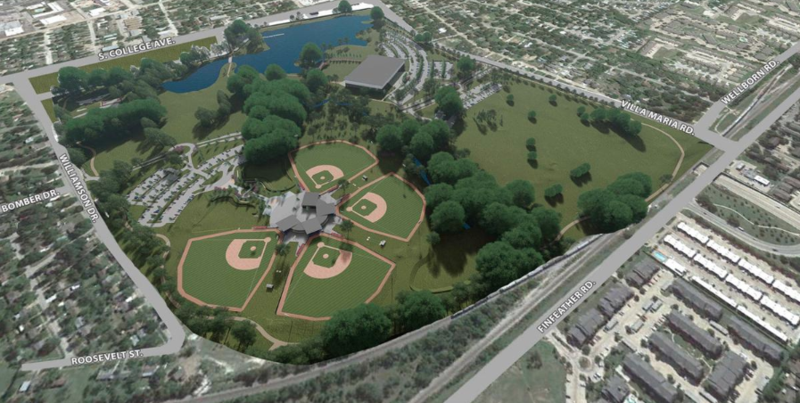 An outdoor amphitheater and "grand lawn" with restrooms and concessions, a water feature and play area. Total cost estimates for this phase are estimated to be between $60-$75 million. Timelines were not discussed, but the city said they expected the project could take anywhere from a few years to twenty years to complete. We will definitely be keeping an eye on this development and the release of new plans!